"Archival photo album pocket pages, including these 4x6 photo album refill pages, are made of photo safe material, which makes them the safest photo pocket pages available to protect your most precious photos. I was so excited when Exposures offered this horizontal/vertical display combination, but was disappointed in the actual product. The pockets are too large to securely hold the photographs in place, especially the vertical slots, which have side openings rather than top openings. The pictures slide around in the pockets so that you can see the white back of the photo behind the one you're viewing and some have even fallen out of the vertical slots! The oversized pockets also create a lot of "dead" or "empty" space on the page. I wanted great quality, since this is for wedding pictures and this item quality looks like what I need. I have that kind of album. Therefore I have to choose the same kind again. I am resorting photos and wanted excellent quality pages to place photos in the oversized album which I purchased from Exposures. It provides the most density and I take a balanced number of horizontal and vertical pictures. 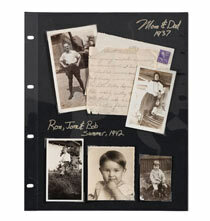 I love this large charter album because it is so beautiful and sturdy and holds a TON of pictures. I had to order another one because I'm just now getting ready to assemble my daughter's wedding pictures..7 years after the fact. P.S. They're still married! Only choice available for oversize album. The options have been greatly reduced since I bought photo pages three or four years ago. I have purchased them before with the photo album. Exactly what I have been looking for. I am making a photo album for my grandchildren to look through and I have a lot of pictures. my photos are all 4Ã?6 and i have a lot of them , this will help me to put them in order and to enjoy and share them without all the fingerprints . It fits albums, even storing 4x6 photos, plus it takes them horizontally and vertically. Because the albums I ordered did not come full of photo pages, so I had to buy them separately. because it holds so many photos (I hope)! Needed them. Hard to find. I love these albums and pages. I can get a whole year in each book. It fits the album I selected (Charter L Extra Capacity). less space using an large abum. I purchased a personalized photo album for my baby boy but it did come with album pages. Thank You, I finally found a company to allow me to add photo pages to my albums!! The album I need refills for has only 2 posts. Will these refills work? BEST ANSWER: Thank you for your question. 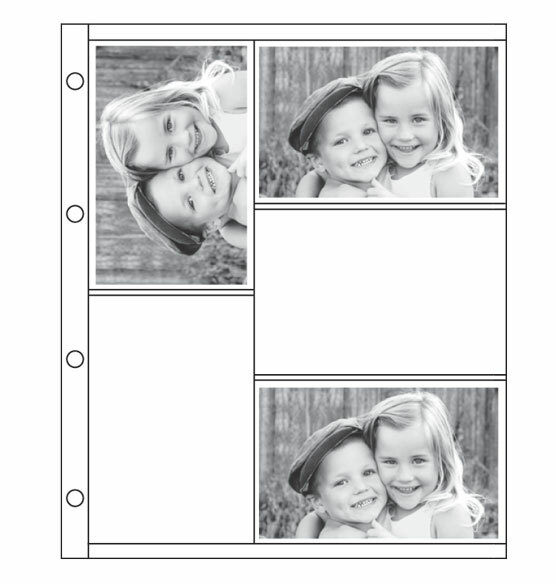 The 4 by 6 Photo Album Refill Pages are designed to fit our standard 4 ring albums. We hope this information will be of help to you. Do the pictures stay in place correctly, or do they come out? BEST ANSWER: I have ten of these albums. The pictures slide a little bit, but nothing is near falling out. I like them well enough to keep buying them. The pictures stay in place pretty well when turning the pages. They shift a little, but I'm completely satisfied with the pages I bought. I am completely satisfied with these photo album refill pages. Yes, the pictures stay correctly in the 4x6 photo album refill pages. I have no problem with the photos slipping out. They stay great. I have used them for years. what is the overall size of the page? BEST ANSWER: Thank you for your question. The overall size of the page is 11 5/8" wide x 14 1/8" high. We hope this information will be of help to you. 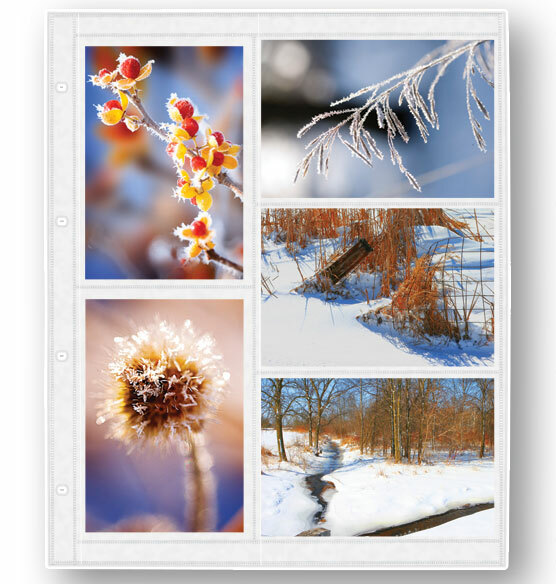 Do you sell this page for 4x6 with vertical & horizontal photos for a 3-ring binder? Thank you for your question. 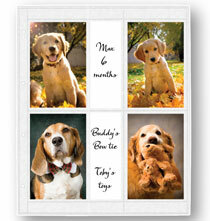 We do sell the 4x6 style also in a 3-ring page. The item number for the 3-ring pages is 309355. We hope this information is of help to you. The page is 12 inches horizontally, 14.5 inches vertically. BEST ANSWER: Thank you for your question. 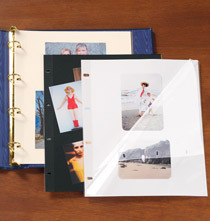 All of our plastic photo pages are made of PU, a type of vinyl. We hope this information will be of help to you. Do you have the photo album for these pages? BEST ANSWER: Thank you for your question. This page will fit into any of our Exposures 4-ring photo albums.We hope this information will be of help to you. Do these refills have 5 individual spaces for pics or is it just a sticky back with a clear cover? BEST ANSWER: They are clear with the option for a picture on both sides so you have spaces for 10 pictures. I used this album to create "over the years" photo albums for my daughters. It worked out very well. Thank you for your question. The pages have slip in pockets for each picture. We hope this information will be of help to you. These are wonderful 4x6 pages. Each sheet front/back holds 10 photo's. I highly recommend this product. NOT a sticky back with a covering film. Clear Plastic page with envelope openings. They have five individual spaces for pictures. Hi don't you have a 12 x 12 size and only have 2 hols? BEST ANSWER: Thank you for your question. We no longer carry the 12x12 pages. We hope this information will be of help to you. How many sheets are in this package? BEST ANSWER: Thank you for your question. There are 10 sheets per package. We hope this information will be of help to you. I have one of your over sized 4-ring photo albums. 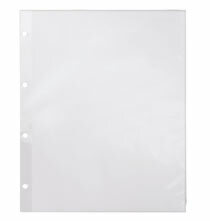 I need a refill page 14"x13-3/8 overall (has 12- 4x6 horz openings per pg). Can't find this item on your site. Any suggestions? BEST ANSWER: Thank you for your question. We hope this information will be of help to you. Thank you for your question. Unfortunately the pages you have ordered have sold out. Since we no longer have inventory and are not expecting further shipments from the supplier the item was cancelled. We apologize for any inconvenience this has caused you. You may want to check at Hobby Lobby if you have one in your area. Yes, I will check with our local Hobby Lobby for these pages. Thanks for your help! which album are these the refill for? BEST ANSWER: Thank you for your question. These pages will fit any of our oversize 4 ring albums. We hope this information will be of help to you.